As part of Educational Interferences, in a search for new audiences and new ways to socialise contemporary art, comes MAPS. A cultural and leisure activity presented and offered free of charge to institutions of Assistance and Social Services working with people with learning difficulties, the disabled, and people at risk of social exclusion, as well as to institutions dealing with cultural diversity issues. MAPS joins contemporary art and audio visual education, providing production environments which are open to experimentation. Understanding artistic practices as practices affecting, interacting and transforming social space. The proposal consists in complementing, by means of a meaningful and enjoyable group experience, audiovisual training with the world of cartography. Learning and exploring our surroundings, to learn how to find our way in the countryside, to enhance the relationship and communication between participants, are among the objectives pursued within this project, designed by Toni Cirera. The specialists at ACVic's educational service , in collaboration with the professional staff of the participating institutions, will adapt the educational proposal to the needs and profiles of individual participants. Starting with an initial structure lasting 9 hours, divided into 3 sessions. October 2011: 2 groups of 6 and 7 participants Riudeperes Residence, Sant Tomàs, PARMO. March and April 2012: 2 groups 7 and 9 participants Occupational Center, Sant Tomàs, PARMO. April 2012: 2 groups of 5 and 7 participants in the Club Social el Pedrís from Fundació Centre Mèdic i Psicopedagògic d’Osona. 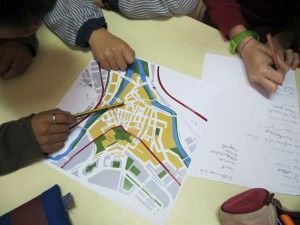 November / December 2012: The project was adapted to the city of Ripoll, where 13 pupils from 5th year at the Escola Tomàs Raguer and 8 pupils from the Escola d’Educació Especial Ramon Surinyach de Ripoll.